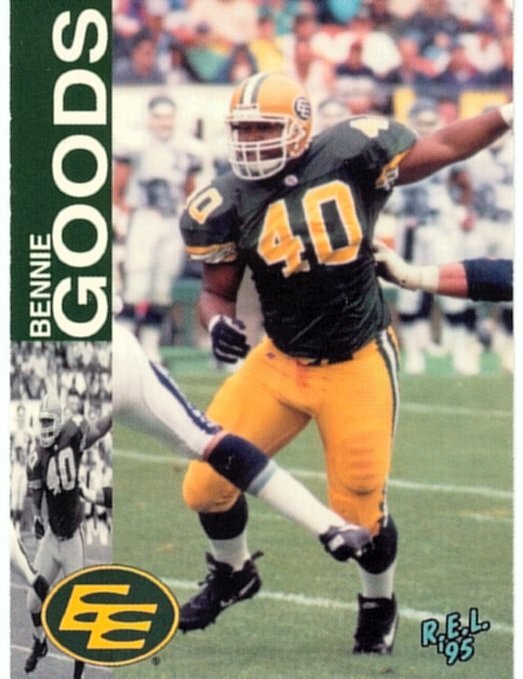 Bennie Goods played 11 years in the CFL as a defensive tackle from 1990 to 2000. Where so often today the quarterback pressure comes from the glamour boys at rush end, Goods provided strong pressure up the middle with 82 career sacks. Goods' sigle season high was 14, achieved in 1993 and matched again in 1995. Goods played 9 seasons (1990 to 1998) with Edmonton after signing as a free agent with the Eskimos in October of 1990. This followed a free agent tryout with the Minnesota Vikings of the NFL. With Edmonton, Goods picked up five division All-Stars (1993, 1994, 1995, 1996 and 1997 - all West All-Stars except the North All-Star in 1995) and three CFL All-Star selections (1994, 1995 and 1996). Edmonton traded Goods to Winnipeg after the 1998 season for a second round draft pick in the CFL college draft, and Goods played two seasons with the Bombers.